We'll begin our trip to the Pacific coast where the westering women began their real adventures, at the far edge of the United States. 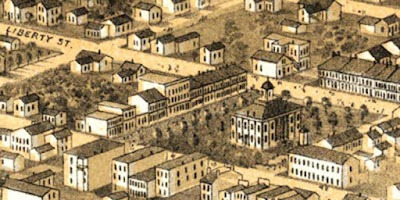 In the 1840s when the wave of western migration began, the land beyond the Missouri state line was Indian and Mexican Territory stretching to the Pacific. The western trail began for many in Independence, Missouri, near a bend in the great Missouri River. Independence's town square in 1854, published by Herrmann J Meyer. The county courthouse was in the town square. The most efficient way to get to the trailheads in the early years of the migration was to take river boats from eastern homes to the Missouri and Iowa borders. 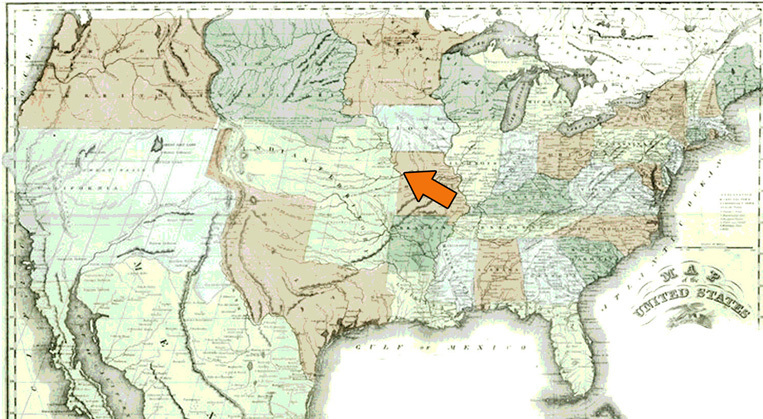 The Missouri River continued north while the immigrants headed over land west by northwest. 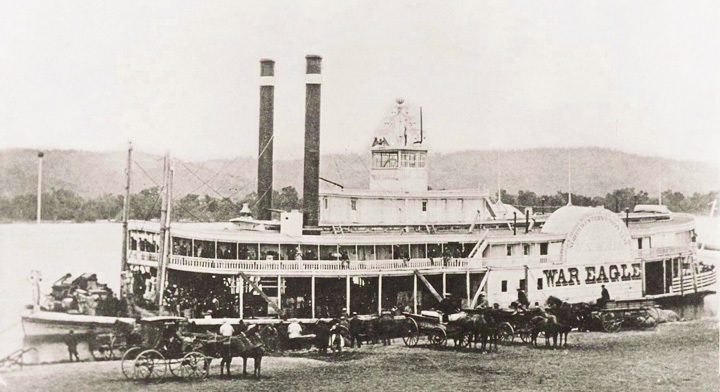 The town of Independence was located far from the riverbank because flooding was an annual problem. 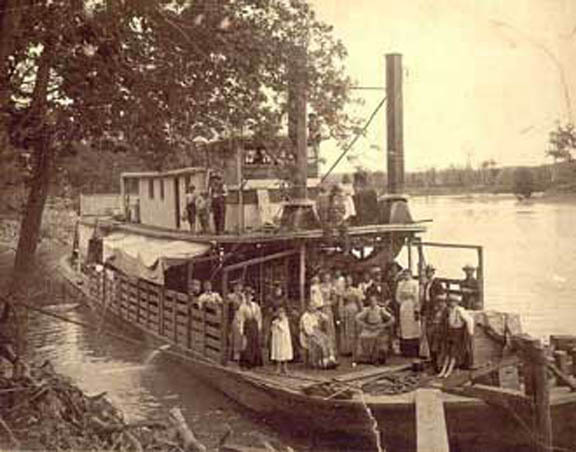 Several entrepreneurs offered transportation from river boats to the town square. Each spring travelers gathered in Independence waiting for May 1st. The prairie grasses needed time to grow to provide food for their animals. If a group left early their stock would have nothing to eat. If they left late the four-month trip would linger into fall snowstorms in the mountains. 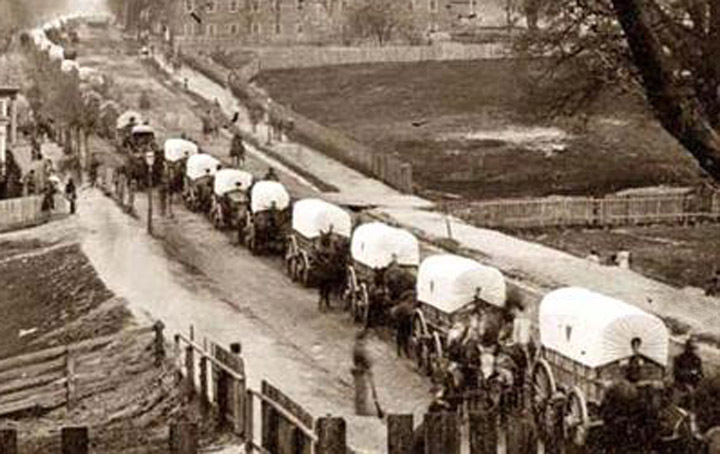 Wagon train traffic photographed during the Civil War. Thousands of wagons left Independence in the first few weeks of May every year. "I am seated on the grass in the midst of the tent....My three daughters are around me one at my side trying to sew....I can give you no idea of the hurry of the place at this time, It is supposed there will be 7000 waggons start from this place this season. We go to California, to the bay of San Francisco. It is a four months trip. We have three wagons furnished with food and clothing &c, drawn by three yoke of oxen each." Most travelers used oxen rather than horses to pull their wagons. 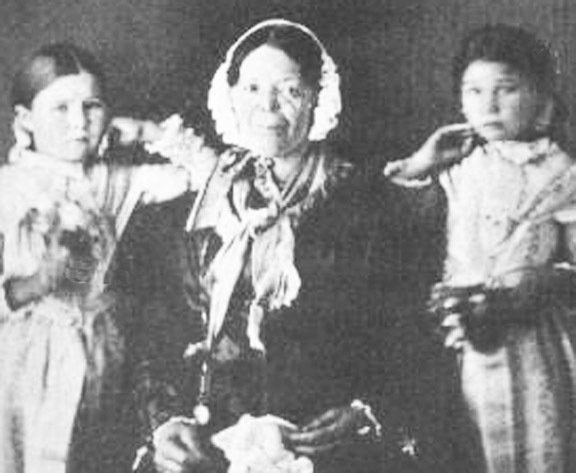 children with a foster mother after their parents perished on the trail. Tamsen Donner's name may be familiar as she was the matriarch of the ill-fated Donner Party who were trapped in the snow-covered mountains because they strayed from the established trail. Tamsen was among those who died in the winter. although it's not the same building. Linda Mooney is using a red, white and blue color scheme. In the 1970s, Mabel Obenchain of the Famous Features syndicate designed a quilt block Independence Square to honor Philadelphia during the American Bicentennial celebration. 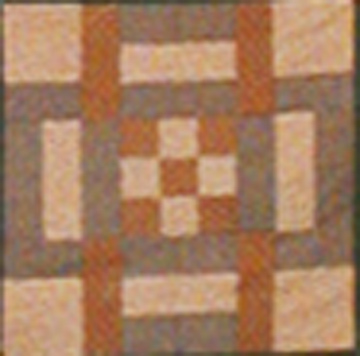 The 9-Patch can also celebrate the old square in Independence, Missouri. 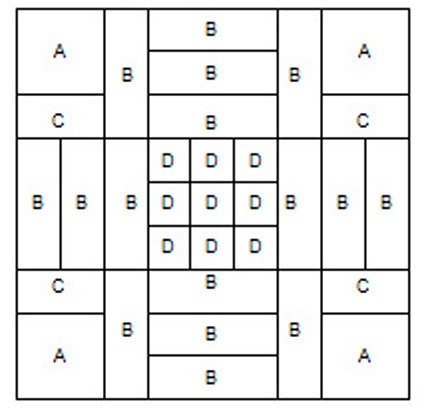 A - Cut 4 squares 3-1/8"
B - Cut 16 rectangles 4-1/2" x 1-7/8"
C - Cut 4 rectangles 3-1/8" x 1-7/8"
D - Cut 9 squares 1-7/8" x 17/8"
Do note Donner mentions that her daughter was "trying to sew" while camping in their tent in Independence. Women were more likely to mention sewing when they were temporarily settled for any length of time rather than when they were camping at noon and night. 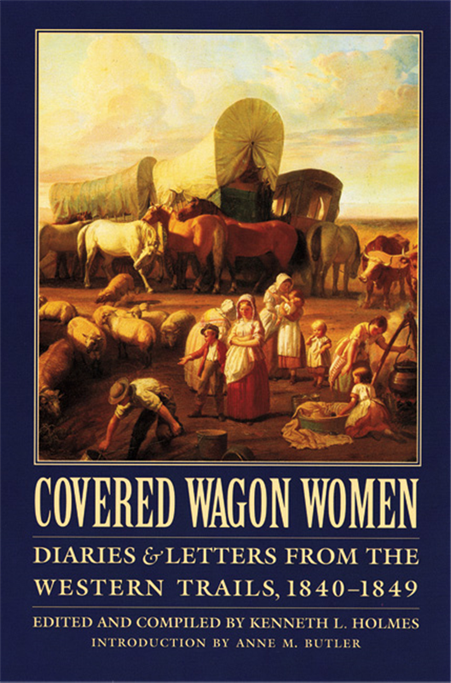 I read Tamsen Donner's letters in Volume 1 of Kenneth L. Holmes Covered Wagon Women: Diaries and Letters from the Western Trails, which includes documents from 1840 to 1849. "If ever there was a moment when America seemed in the grip of some great, out-of-the-ordinary pull, it was in 1846. The whole mood was for movement, expansion, and the whole direction was westward." If you are brave enough to watch it bring snacks and a couple of warm quilts. Just remember it's a worst case scenario. Barbara, we rode flat out moving fast in a real stage coach! Gloriana !!! your bones ached for days. It was that jarring. I have total respect for the pioneers using covered wagons. No highways for sure...just a trail over miles and miles to road. Thanks for this quilt. Thanks for another great BOM. So much to learn. Good to know they didn't actually stitch as the wagons plodded along! considering how tired everyone must have been as most walked beside the wagons I don't see when they would have been able to make quilts - it certainly was not an easy life, when camp was made for the night think of all they had to do, cook, mend, wash diapers,, collect fuel for fires etc - the movie and tv versions always show them having fun too, but I bet there was little of that. Thanks for your history posted along with the blocks I find it very interesting as we have traveled most of the Oregon trail in the comfort of a motorhome and have seen a lot of the places mentioned in history. Beautiful block, Becky! Love the attention to detail. We drove from California to Boston and back last summer -- it's a LOOOONG trip. I'm excited to be taking this new journey with you. I had a Westering Woman, who at age 15 drove the Wagon! She is one of my favorite ancestors who Quilted until she died at 91. I did a reenactment TREK and rode the wagon. Very bumpy ride. Thanks Barbara. Lovely block. If they are all this simple I should be able to keep up! Independence is my hometown- birth place 45 years of my life. As a child (1960) the wagon trail was done again as a celebration. It really was something to see the wagons and people all around the court house. I want to do the BOM ! This is so , I have a lot of civil war fabric that is just waiting for a HOME. This is the last Wednesday of the month so where can I download the pattern ??? I found your blog yesterday while I was on a break from organizing my sewing room and I joyfully signed up for email updates. I would like to do this sew along, which will be my first one. It's funny that after I signed up I found a book in a drawer that I had forgotten about, which had belonged to my mother. It's called, "My Folks Came In A Covered Wagon" A Treasury of Pioneer Stories, published in 1956. Looks so interesting! You don't download it. It's there in the blog post. Do you want to copy it to a file or print it? What a cool block. I am seeing not only the r-w-b, but also green as the journey had to start in early Spring time to be over the mountains before winter came....hmhm...got me thinking. I am in awe of our ancestors. If we had to do it today...would we? Feel free to make these 6" blocks. I am trying to find blocks that fit into a 6/9/12 grid so cutting should be no problem. Barbara, I'm trying to figure out the dimensions of the pieces. Is it 12" finished or unfinished? 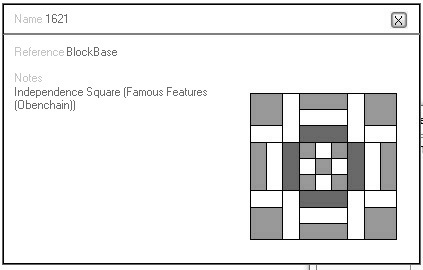 I'm inclined to make it simpler by assuming 12" unfinished, thus a 3 x 3 grid. 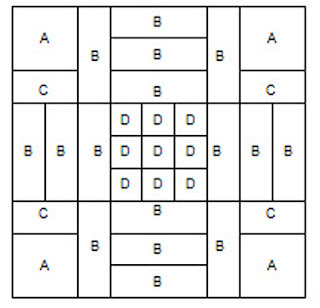 That would make the center 9-p out of 1.5" squares and the 3-bar blocks made out of 1.5 x 3.5 pieces. Will that work? OOPS! I realized my errors in the above comment. Your block is 12" and I'm mentally redrafting it to be 9". SORRY! Very fun block to make and it went together very nicely.The directions and color suggestions helped me immensely. I am looking forward to your monthly posts; I appreciate that it will be a monthly event - I think I can work this into my schedule! Thank you, also, Barbara, for all you do to keep the history of quilting, women and our nation out in the public stream of information as a positive experience. I refer to your books, blogs, and other shared information/facts/stories frequently when teaching quilting and when discussing quilts with friends or groups. I am in awe of your energy and dedication to sharing and improving the depth of knowledge of quilts, fabric and the lives of women. You are very appreciated!Thank you,again! I'm looking forward to getting started. Just wish I knew what to use. I mainly have precuts. I don't know if it should be Calicos or your fabric lines which are darker. Maybe you can give us some suggestions. I'm off and running - finished my first block last night. My quilt will be scrappy, with fabrics from my scrap bags and stash. I love all the historical references you've provided - my favorite kind of reading. I'm having trouble with the math for this block. My pieces don't fit together. 1 7/8"x 3 - 1" (seams) =4 5/8 not 4 1/2 that the length of the bar is cut at. My center square and width of bar blocks is larger than the 4 1/2", thus they don't fit together. What am I missing or doing wrong?? Can anyone figure out anon's problem here? I'me having the same problem ... my center checkerboard is larger than the strip sections. I just read The Oregon Trail book and look forward to reading Covered Wagon Women. Thanks for all the history you share. I will be making the blocks if they come in my email box. Oh, yes! I am definitely going to have to join in on this one. I haven't participated in any of yours since you did the block of the week for the Civil War anniversary and I loved that quilt. It won 3rd place at the Dallas (TX) quilt show and now resides with my granddaughter and her new hubby. We moved to Oregon in 2014 and I love reading about the wagon trains. It's so hard to imagine what they had to go through. Doing the quilty math, for the 3 B-rectangles to equal 4.5" on one side to match the A+B+C corner, the width of the B rectangles should be (4.5"/3)= 1.5"; however only the middle B rectangle needs a 0.5" seam allowance, the outer two only need 0.25". So, the middle B rectangle can be cut 2", but the B rectangles on the outside should be cut to 1.75. However, if you've already made the unit, it will probably work to trim equal amounts from each side to get to 4.5". Ditto for the center block. I had to trim about 1/8 on all 4 sides and 1/8" on either long side of the pieced B-rectangles unit to get them to 4.5". Which is good, because now my units are all the correct size. I prefer making units a bit larger and then trimming them up! I too had trouble fitting the 9 pieces together (4 corners, center, and 4 side strippy pieces). I unsewed them and then trimmed each to 4-1/2 x 4-1/2". Then they went together just fine. I love Barbara's history and historical images. It's great to learn fact from myth. This is a fun journey. My 3rd great-grandfather, William Kincaid, knew Ezra Meeker. They served on a trial of an Indian who was falsely accused of murder. 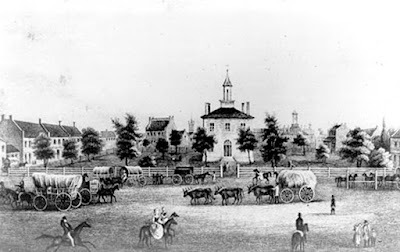 Ezra traveled on the Oregon Trail as a young man with his wife and baby. In his old age he was concerned that people were forgetting about the trail, so he did the trip again, several times. Much publicity. His house in Puyallup, Washington is now the home of the historical society there. Mine is coming along but I have way too many mixed prints. I'm glad it's a practice. Haven't finished so I'm not sure if it's 12 in. I'm measuring each of the 6 blocks at 4.25in. Actually each block is 4.25 after being sewn! Where do we share the photo when the block is finished. Maybe I didn't read all of it. Thanks form the block instructions. I love how my block looks. My great,great,great grandfather made the trek from Wisconsin to Oregon in 1852 -- he didn't stay but returned to Wisconsin 18 months later with a collection of notes that he transcribed into a journal of his trip which is still passed down from generation to generation. I'm looking forward to the benefit of all your research and appreciate the references! This is quite amazing. I love the block, colours of the fabric used. But, the history lesson, as well. I'm English, born and bred and obviously know the history, somewhat. I moved to a tiny island in the Mediterranean called Gozo (Malta). 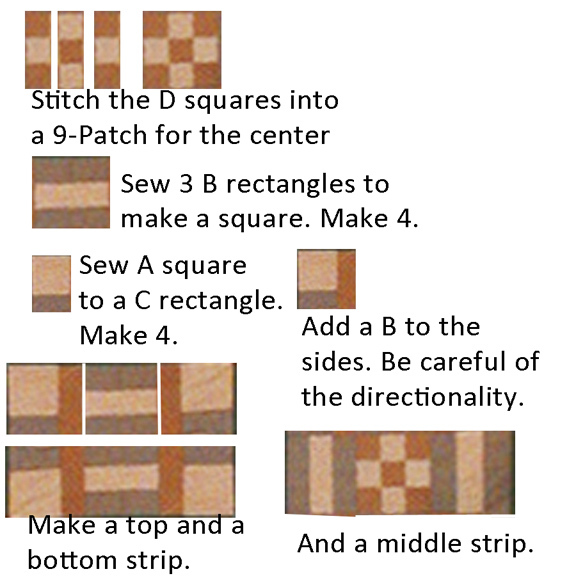 I am currently taking patchwork quilting lessons. Love it!!! So to find this information is so unbelievable. This is what I want to create. I look forward to more.....quilting and history. Incredible. Thank you. The math problem is that you can't divide 4 by 3; well you can, but it gives a periodic number. So, you could cut 1-13/16 " -which is a 1/16 less than 1-7/8 - or adjust by positioning the needle of your machine. I love these fabrics and am looking forward the next block! And the History is very interesting! Thank you! The "Vulture Peak Patchers" in Wickenburg, AZ have chosen to use your series "Westering Women" as their BOM. We were inspired to do this because our local museum... Desert Caballeros Western Museum... is displaying their collection of quilts during this year. Some of our members have been working with the museum in preparing the quilts for display. Visit their website at westernmuseum.org Our members are very excited to follow along as you travel west. Looking forward to this. Just found it yesterday and spent today catching up. The blocks are beautiful! And I love the history! Barbara, can you tell me what fabrics Becky used for the first block? I recognize the beige background fabric from Alice's Scrapbag but not the others. I LOVE that gold with the leaf stipe and the blue! 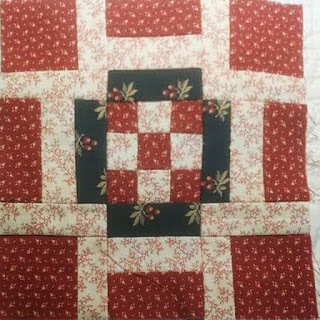 Click on Marty Webster's block to see the pattern for Love Apple..
Click on Karen's block to see the pattern for the Virginia Cockscomb. Click on Bettina's Periwinkle Wreath to see the pattern. 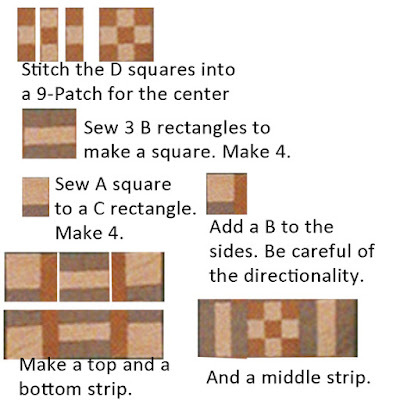 Click to see a post on fabric, set and a pieced border. Click on the images below to see sites with pictures from the Quilt Along series. Click on Louisa's face to see the group. Ask to be added. The hashtag is #hospitalsketchesBOM Click to go there. Click on the photographers to post photos of your blocks, fabrics and any inspiration. Click on Indie's face to see our select group. Ask to be a member. I'll OK you. Post pix. You get an email with the content every time I post. Just type your address in the spot below. Type a word or two in the space below to search this blog. Click to see the listing in my Etsy shop. You can buy them as a PDF to download yourself or I will mail them to you on paper. Keep track of Antebellum Album Patterns. Click to see a Pinterest page with links to each pattern as they are posted in 2018. Last Wednesday each month. 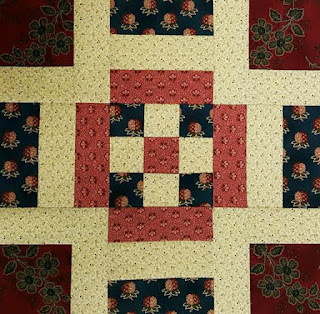 Click on the Smithsonian's Stars & Stripes bedquilt to see my Pinterest page with actual Civil War era quilts. Click on the picture to see lots of my Civil War books and others for sale. Fifty quilt blocks originally posted on this blog and made by you readers. You can still buy an actual book from C&T. Click to see. Patterns & history from my first book on the topic. I still have new copies of the bound books in my Etsy shop. I'll sign it. Click to see more. 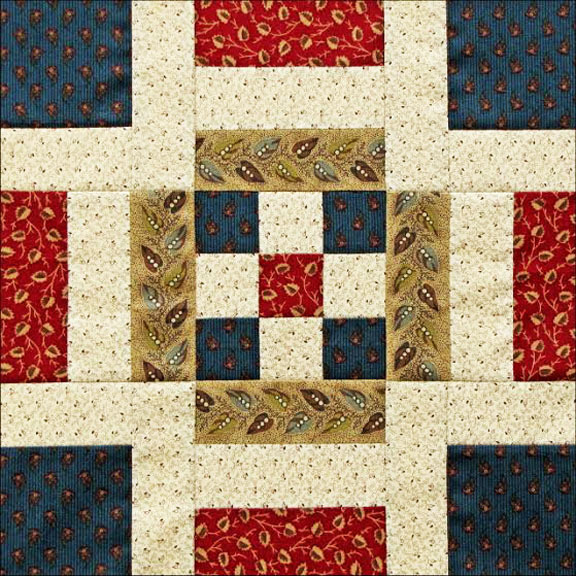 Sampler Quilt to Recall the Civil War Along the Kansas/Missouri Border. A BOM with 14" traditional blocks and lots of history. I'm out of books but check Amazon by clicking on the link below. Traditional blocks to "Unravel the History of Quilts and Slavery." Click here to see print-on-demand & digital editions. Go to Amazon below to see more. Pattern copy and text (c) Barbara Brackman 2011.